According to RÚV (the Icelandic National Broadcasting Service), SLAYER is suing the organizers of Iceland’s Secret Solstice music festival, claiming it hasn’t been fully paid for appearing at last year’s event. For last year’s event, Secret Solstice offered an ultra-luxurious $1 million ticket, which included transportation in a private jet, daily access to a glam squad, a VIP yacht party, a helicopter tour over the glaciers and volcanoes of South Iceland. 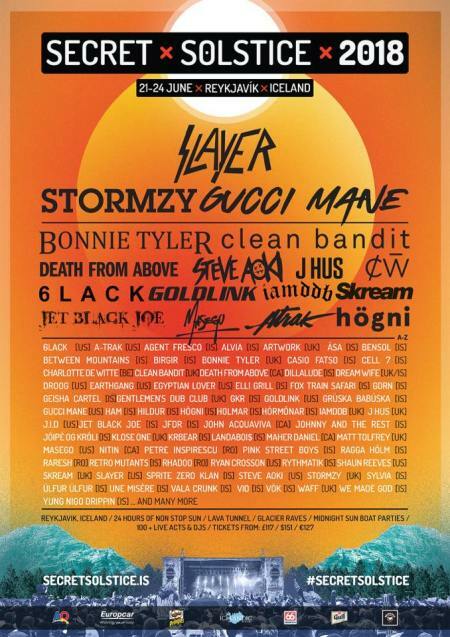 Last November, it was reported that the 2019 edition of Secret Solstice would be smaller than in previous years. This was decided by a majority of the city council at a council meeting after the number of public complaints had risen due to the fact that the festival takes place in a quiet residential area. The length of the festival will be shortened to three days, the price of tickets will be reduced, and each day’s events will wrap up by 11:30 p.m.